If you've ever wondered how to make a metal candle mold from normal household supplies then take a look at some of these interesting and unusual ideas! Some candle makers love to make a metal candle mold, so that they can avoid the cost of buying new metal molds; because they are looking for something a little different or special. While making proper metal aluminum candle molds is impractical for most candle makers as this requires specialist equipment and skills, there are many ways of making metal candle molds from normal household supplies. Heat resistance - most metal will be heat resistant. However it is necessary to check for any special coatings or other aspects that might affect the heat resistance of a metal object. The mold will need to contain very hot wax and therefore it is important that hot temperatures will not cause any damage. Leak proof - it is essential that a metal object used as a candle mold is totally leak proof. If there are any gaps then melted wax may spill and this can be dangerous. The best way to check is to pour water into the mold and see whether any escapes. This will show that the mold is watertight. Shape - the shape of a metal object that is to be used as a candle mold must allow the candle to be easily removed. If the mold is shaped at the sides or wider at the base (as the candle is poured) than the top, then the candle will not be easily removed. Good shapes to look for are cylinder shapes with smooth sides. Cake and baking tins are ideal for using as candle molds. They meet all of the above criteria (although always check that a tin is waterproof before using in case it has sustained damage). 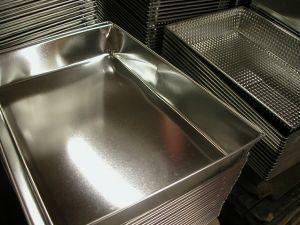 Cake and baking tins are available in a wide range of shapes and sizes. From tiny muffin tins through to large cake tins. Flat baking trays are also good for making sheets of wax or for making wax chunks to be used in chunk candle making. The cake tins should be extremely well cleaned before they are used to make candles as any crumbs or dirt can affect the burning of a candle. Cake tins should become dedicated craft or candle making tins once they have been used to make candles. Tin cans also make good candle molds, however it is important to make sure that they do not have any shaping that might make it difficult to remove a candle when it is finished. Very large tins are ideal and are a good way to produce unusual candles. Sometimes it is easier to make a candle without a wick, particularly when making very large or unusually shaped candles. A metal skewer might be necessary to make a hole through the wax so that a wick can be threaded through. Very large candles might require multiple wicks in order for it to burn effectively. An attractive effect, however, can be achieved by letting the candle burn in the middle and leaving the outer shell intact. When making candles using molds that are not specially designed candle molds, it is important to pay extra attention to health and safety issues. If there is any doubt at all then don't try to use an improvised mold. Proper candle molds are relatively low priced and they are a reliable and safe alternative to using improvised molds.